Jaipuria Institute of Management, Indirapuram, Ghaziabad intends to provide and develop the capabilities of the young managers by raising their level of competence and intellect to face various challenges in the global environment. 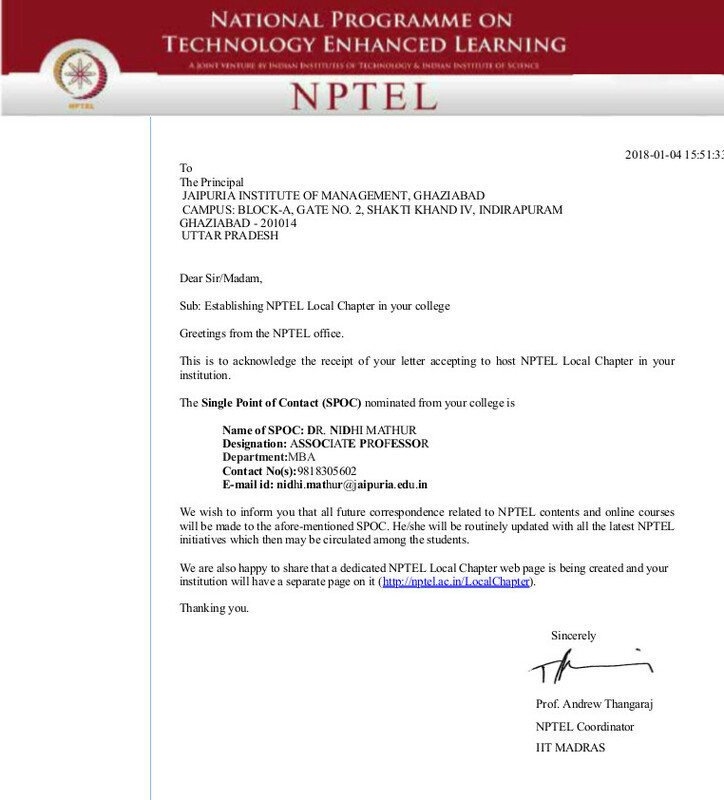 In pursuit of excellence, Jaipuria Institute of Management, Indirapuram, Ghaziabad becomes LOCAL CHAPTER of NPTEL. The Local Chapter is an initiative taken by the project NPTEL, to encourage students across the country and ensure that online education reaches everybody. The National Programme on Technology Enhanced Learning (NPTEL), a project funded by the Ministry of Human Resource Development (MHRD), provides e-learning through online Web and Video courses in Engineering, Sciences, Technology, Management and Humanities. This is a joint initiative by seven IITs and IISc Bangalore. Other selected premier institutions also act as Associate Partner Institutions. SWAYAM is the National MOOCs portal being developed by MHRD, Govt. of India.In order to ensure best quality content is produced and delivered, seven National Coordinators have been appointed under SWAYAM. NPTEL is the official SWAYAM national coordinator for engineering. All NPTEL online certification courses are SWAYAM courses too, and they are available on the SWAYAM platform as well. © Copyright 2018 Jaipuria Institute of Management Indirapuram Ghaziabad. All rights reserved.